2) Chips are pretty good, not incredible or anything, but pretty good is more than good enough for fish & chips. Like Simon & Garfunkel, there's a reason it's not called "chips & fish"
Anyway, we used to think that Olde Yorke fish & chips were likely to be the best fish & chips we would ever find in Toronto, but the green reed which bends in the wind is stronger than the mighty oak which breaks in the storm & once we went here we quickly realised that, like the music of Oasis, while Olde York fish & chips would always hold a place in our hearts, it was close to impossible for us to imagine any circumstance under which we would ever go back there. Turns out we wrong (although not about Oasis). Tonight was one of those evenings where lacking the wherewithal to make a reservation, we couldn't settle on a suitable place to eat. Our brief love affair with Off the Hook had come to a tumultuous end one evening a few weeks earlier when frustrated by the lack of service we had done the march out without paying & now we were too scared to show our faces again, so instead we sought refuge in Olde Yorke's tender embrace. We got a table a little faster than normal, perhaps because we arrived after 8pm & what with the average age of the clientele skewing considerably higher than a lot of our usual spots. The decor is authentically tacky & overall an air of relaxed familiarity pervades. However, it has always been our firm belief that relaxed familiarity is a dangerous thing; once people get too relaxed they start nipping to the shops in their slippers & from there, we are only a hair's breadth from complete anarchy. Fortunately, before society had a chance to collapse completely, our haddock arrived. L is not going to sit here & tell you that the fish was anything other than deep fried flaky perfection. J on the other hand, is a cruel mistress & although she too thoroughly enjoyed the fish, she was struck by how the batter, which she had previously thought so incredibly highly of, was noticeably thicker & ever so slightly more greasy than that at Off The Hook. While L would concede that she has a point, he remains unconvinced that ever so slightly greasy thick & crispy batter is a negative when it comes to fish & chips. In fact, L is such a fan of this style of batter that he is willing to make the ultimate sacrifice, Toronto Public Health permitting, & have the good people at Olde Yorke deep fry his entire body, preserving him in their delicious batter, a la Han Solo at the end of Empire. In further tribute to a beloved film series from his childhood, L would respectfully request his body be displayed at City Hall, as presently Toronto's closest equivalent to Jabba's palace. Ah! 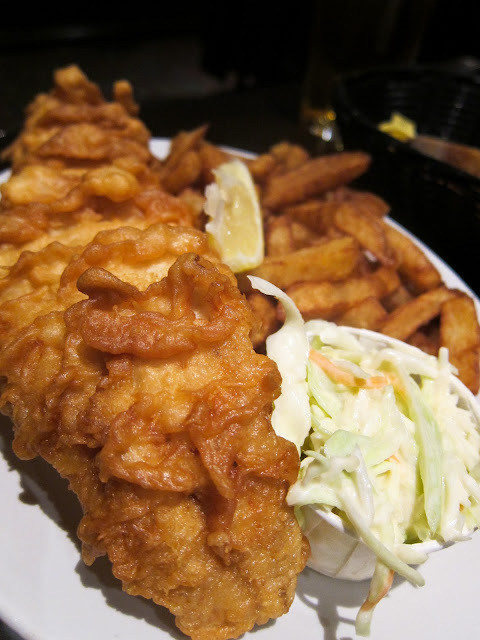 So the best fish & chips place in toronto debate is still on. Thanks for sharing. I'm still on the hunt for the best place as well. I recently discovered a place called "the one that got away" which I was pleasantly surprised. I wonder if the liking for it will change like yours did when you went back to olde yorke.